Since the release of Kingdom Hearts 2 in 2006, fans have eagerly anticipated the release of Kingdom Hearts 3. However, Square Enix saw fit to not give the fans what they wanted but rather spin-off after spin-off on every system imaginable from the Nintendo 3DS and PlayStation Portable to mobile phones. 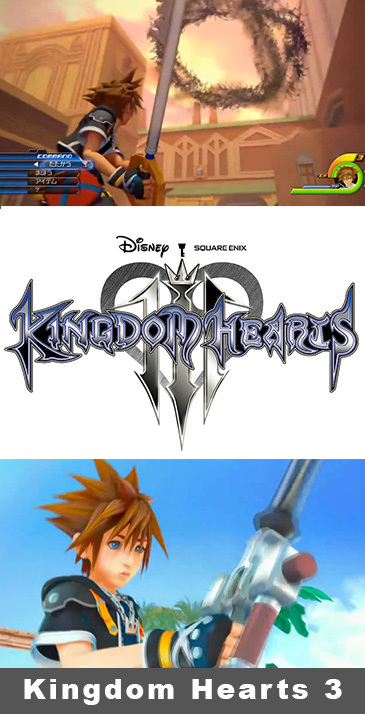 Four spin-offs later and Square Enix has finally announced Kingdom Hearts 3. Why now? Kingdom Hearts producer Tetsuya Nomura explained at E3 2013 that "many fans were feeling impatient due to our continuous releases of spin-off titles" so he felt the time was right to finally announce the game. Better late than never. So what do we know about Kingdom Hearts 3? Well, not a lot, outside of the fact that it will focus on Sora and not one of the many ancillary characters released since the original game. The game looks to finally be a direct continuation of Kingdom Hearts 2, rather than being set ten years in the past, or in-between Kingdom Hearts 1 and 2, or whatever other nonsense Nomura has come up with. Outside of the above teaser trailer, which really serves as more of an advertisement for the series as a whole (gotta love that advertisement for HD 1.5 Remix at the end! ), not a lot of other details are known. What we know is that the game focuses on Sora fighting against Master Xenahort and a quest to find allies and the Key to Return Hearts. What this translates to is an excuse to travel to new Disney-themed worlds, and with the recent acquisitions of Marvel and LucasArts, this could be one of the best Kingdom Hearts games yet in terms of surprise appearances. Could Sora end up fighting alongside Iron Man and Luke Skywalker? Possibly! But hey, the fact that Sora returns and the game finally pushes the story onward is enough reason to celebrate, even if Marvel and LucasArts are nowhere to be seen. What we know about the gameplay is even less than the story. Judging by the trailer, it looks like the classic Kingdom Hearts gameplay remains intact, something that will make many fans of the series happy. Sora will once again be travelling alongside Donald and Goofy though this time Mickey is also coming along for the ride. Currently, no release date is known at this time but don't get your hopes up for it being any time soon. At E3 2013, Nomura seemed upset that the game was unveiled, claiming "Considering where we are in development, it may have been a little early." What we can take from this quote is that the game is still very early in development, making even a 2014 release date a low possibility. In January 2015, one of the voice actors for Kingdom Hearts 3 posted to Twitter that the game will be releasing in 2015, much to the delight of fans everywhere. However, Square Enix quickly put out a press release stating that the voice actor was incorrect, and no official release date has been determined. Who do you believe? In the meantime, keep your eye on this page and the PS4 Experts site in general for any new info! Say what you will about the other games being spin offs but Kingdom Hearts 3D was a direct continuation of Kingdom Hearts 2.